These are the wrong questions, and that’s a huge problem because I believe the questions you ask yourself can change your mindset and how you approach your writing. What are the right questions? 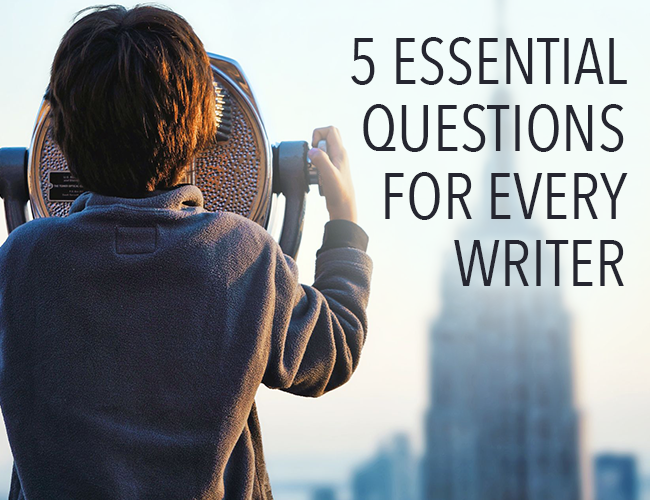 In this article, I’m going to share the five essential questions every writer should ask themselves. I first had the idea become a writer when I was 17 years old. I was in my room, reading a novel by Charles Dickens, probably A Tale of Two Cities, and for some reason the characters and the story touch me so deeply that for a moment I felt connected. As I read the book, I felt like I wasn’t alone. You see, like many kids, I was bullied in school, and for me it had the effect of silencing me. I didn’t trust people and I had very few friends. But for some reason, reading that book at that moment, it was as if Charles Dickens had reached through 120 years of history and spoken directly to me. In that moment, that question people always ask when you’re growing up popped into my head: “What do you want to be when you grow up? In other words, I wanted to become a writer so I could connect. The First Essential Question: Why Do You Write? [We write out of] sheer egoism. Desire to seem clever, to be talked about, to be remembered after death, to get your own back on the grown-ups who snubbed you in childhood, etc., etc. It is humbug to pretend this is not a motive, and a strong one…. Serious writers, I should say, are on the whole more vain and self-centered than journalists, though less interested in money. In other words, Orwell says we write to be admired. But honestly, I think George Orwell was wrong. Fame, admiration, self-centered vanity aren’t really what we’re looking for. The truth is, being known, being loved, is so much better than being admired. For most of human history, artists have been part of the community. Connectors and openers, not untouchable stars. Celebrity is about a lot of people loving you from a distance. But the internet—and the content we’re freely able to share on it—is about taking it back. It’s about a few people loving you up close, and about those people being enough. Ask yourself, “Why do you write?” Why do you really write? Is it about fame? Vanity? Celebrity? Or is it deeper than that? Do you write to connect? The Second Essential Question: How Do You Change People? I think it’s great to make money at writing. I think it’s important to get paid for your work. However, the question, “How do I make a living writing?” is the wrong question. Instead, how do you CHANGE people with your writing? Because if you can offer transformation people will pay whatever you ask. The Third Essential Question: What can you write that no one else can? Because if you can write something unique, something different from anything else in the market, something that people also like, your fans will buy everything and anything you ask. The Fourth Essential Question: How do you connect your emotions to your story? “No tears in the writer, no tears in the reader,” said Robert Frost. How do you get so deep into your characters (or else choose characters similar to you and your story) so that you can summon the emotional depth necessary to tell an entertaining and transformative story? The Fifth Essential Question: How can you LIVE a story as interesting as the ones on the page? Because of you look at the writers we most admire they took risks with their lives. Ernest Hemingway, Mary Shelley, John Steinbeck, Virginia Woolf—they all lived lives as interesting as the ones they wrote about. Part of their marketing (their platform you might say) was based on how they lived, not just how they wrote. Your biggest asset as a writer is your experiences. How are you going to create experiences that help you be a better writer? What are some other questions you’re bringing to your writing? Why do I struggle at the end? What if no one connects with my art? What if I try to write one story and it becomes something else? What do I do with my fear? What if I’ve outgrown my story? Does rewriting always make your story better? How about you? What questions are you bring to your writing? Let me know in the comments. Pick one person you would like your writing to connect with. Then, write something just for him or her. Write for fifteen minutes. When you’re finished, share your practice in the comments section. And if you share, please be sure to give feedback on a few practices by your fellow writers.